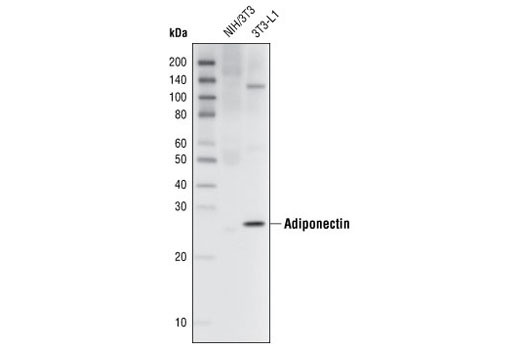 Adiponectin (C45B10) Rabbit mAb detects endogenous levels of total adiponectin protein monomer. It will not detect higher molecular weight forms of adiponectin. Monoclonal antibody is produced by immunizing animals with a synthetic peptide corresponding to human adiponectin. Adiponectin, also termed AdipoQ, Acrp30, apM1 and GBP28, is an adipokine expressed exclusively in brown and white adipocytes (1). It is secreted into the blood and exists in three major forms: a low molecular weight trimer, a medium molecular weight hexamer and a high molecular weight multimer (1). Adiponectin levels are decreased in obese and insulin-resistant mice and humans (2), suggesting that this adipokine is critical to maintain insulin sensitivity. Adiponectin stimulates the phosphorylation of AMPKα at Thr172 and activates AMPK in skeletal muscle (3). It also stimulates glucose uptake in myocytes (3). The block of AMPK activation by a dominant-negative AMPKα2 isoform inhibits the effect of adiponectin on glucose uptake, indicating that adiponectin stimulates glucose uptake and increases insulin sensitivity through its action on AMPK (3). Adiponectin mutants that are not able to form oligomers larger than trimers have no effect on the AMPK pathway (4). Mutations that render adiponectin unable to form high molecular weight multimers are associated with human diabetes (4), indicating the importance of multimerization for adiponectin activity. Yamauchi, T. et al. (2002) Nat. Med. 8, 1288-1295. Waki, H. et al. (2003) J. Biol. Chem. 278, 40352-40363.